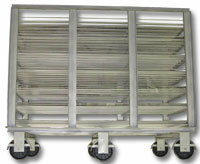 Simply Manufacturing builds the best, no matter what you call them racks, trees, trucks, cages or carriers. We use high quality materials that are constructed to exacting standards. Our design team can build to your exact specifications, or offer design improvements. Key specifications that we evaluate are: dimensions, capacity, mobility, airflow, corrosive environments, durability and compatibility with existing systems. See below for specific examples. 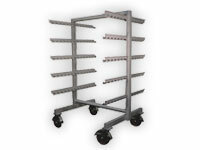 The industry standard with a wide variety of options including zinc plated or more durable stainless steel casters; Maxim or highly durable nylon wheels, Delrin corrosion resistant bearings, and splash resistant fenders.